I like it. Of course now I'm a bit bummed that my ultra new Gen7T is already out of date . Anyway, I did have a couple comments. I like that max endstops are gone, and motor connectors are standardised to the .1 inch connectors everyone else seems to be using. Compatibility is a good thing. Would it be a good idea to change the bed/hot end power connector from molex to an atx +4 connector? That way you wouldn't need to solder wires to the board if you want to run a heated bed. Why not lengthen the 5V jumper and route the serial lines more directly? Be assured, it isn't. I just think this TB6560 stuff still has some way ahead before it's fit for general usage. And I couldn't hold back longer with the enhancements around the thermistor. I thought about this for v1.3 already and the result was, the ATX +4 connector (both pins) is specified for only marginally more than the Molex 4-pin ones. So I decided for compatibility with older PSUs. I don't see an advantage here. Shorter bridges are easier to solder than longer ones and isolation routing is almost for free. Is there a spot in the expansion header that is compatible with either SD RAMPS or sanquinololu SD card boards, or would that be difficult on this design? Well ... this is about the most discussed topic on this board. About every electronics engineer apparently has at least two opinions about MOSFET design, so I have some 20 different recommendations so far. None of the engineers can come up with clear design rules (formulas) or a schematic which is provenly better than the current one without being more expensive. "I did this and that and it works for me" or "you can read up on this topic here and there" is ... *ahem* ... isn't useful. So, if you think you can design a MOSFET switch fast enough for 80 kHz, thick enough for 15 amps and with part costs less than $1 (that's about what the current design can do), please provide me a Gen7 schematic modified exactly the way you think it's right. I'll send you a milled copy then. Edited 1 time(s). Last edit at 04/09/2012 06:33PM by Traumflug. Traumflug... I don't know why you are so put off by 'information' and why you think what I posted was 'opinion'. If you do a few calculations based on the information I posted along with some basic knowledge of IC device IO parameters you should be able to determine that there is a simple zero-cost improvement you could make to your design. Benefit, less heating in the FETs you've already selected. Hint... try a lower series gate resistor instead of the 1K you currently have in your schematic. I don't know why you are so put off by 'information' and why you think what I posted was 'opinion'. Because all these 20 recommendations are contradicting. If the calculations are that simple, please do them. try a lower series gate resistor instead of the 1K you currently have in your schematic. I think you're talking about R11/R12, which is 10 ohms. I had to find this the experimental way: [reprap.org] . And yes, I also got recommendations which said 1K is fine. The .pdf of the schematic posted in the GitHub repository has R11/R12 at 1K, thus my comment. At 10 ohms your asking for more current from the AVR than the 20ma rating of the IO pins (no calculations needed - it's in the datasheet). To stay within the limits of the AVR's IO pins would need a 250 ohm resistor. So, this goes back to my original post here. The design would benefit from a high current driver between the AVR and the gate of the FET that is capable of driving the capacitance of the gate with a low value series R. While this wouldn't be 'cheaper' (your criteria) it would be a design improvement. Generally, I'm happy to try to help people (if I can) but every once in a while there are people that aren't receptive to being helped (and that's fine too). Since my posts seem to bother you I'll refrain from responding with additional information. The problem is using 80KHz PWM to drive something with a thermal time constant measured in second, crazy. All I do is switch my bed on if the temperature is too low, else turn it off, in a 100 Hz interrupt. In that case I don't need high gate currents and the resistor can be high enough to not stress the micro. 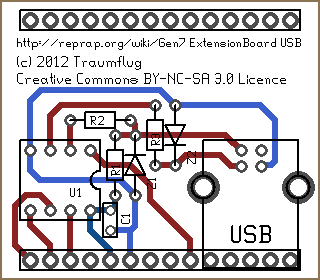 - Very popular electronics, notable RAMPS and Sanguinololu, use this (over)simplified design and the community says this is working well. "It works" also means "it's sane" for most RepRappers. So, if one would enhance a design without visible benefit, people would tend to choose the cheaper variant. Perhaps not because of a 3-cent resistor and two solder points alone, but the tendency exists. - Coming up with a design not capable of doing 80 kHz PWM is a recipe for failure, because people upload firmwares without even looking into the config. Think what happens if a few posts appear like "this new firmware works great on my RAMPS, but it has blown the MOSFETs of my Gen7". That's pretty much the same as "If you want the latest features, avoid a Gen7". - Also firmware related, one has not only to design a proper circuitry, but also to modify and maintain a dozen or more firmwares. Look at how long it took until mainstream firmwares started to accept running at a 20 MHz CPU clock. Over a year! Despite having more processing speed is a clear benefit, I had many many discussions with people trying to explain me 16 MHz is more than one will ever need. - A bad excuse, I'm a mechanical engineer and not an electrical one. For everything beyond ohm's law I can only copy what others do. Gen7 was started to make electronics replicatable and to develop processes allowing PCB printing. That said, I hope this 20 mA rating of the ATmega (my data sheet says 40 mA on page 325) output means 20 mA on average. -"Remove all tracks on this layer ( = all light blue ones = all of the GND net minus vias and bridges, find the net with Menu -> Window -> Netlist)." I have deleted all the light blue tracks, however I don't understand the part about the Netlist. "GND net minus vias and bridges" - I can't find any "vias" or "bridges" in the lists. As I do an "optimize rats nest" after drawing the rect nothing seems to happen. Is this correct? -"For pins and pads you actually want to connect to the ground plane, set a Thermal". I hope this isn't a stupid question: Which Pins or Pads have to be connected to the ground plane? In fact I would also be pleased about an already optimized Gen7 v1.4 board layout which I only have to print out, but I couldn't find it. 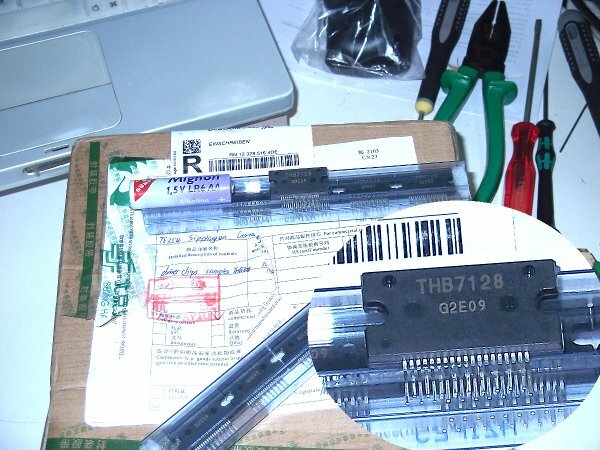 Thank you for your great instructions on assembling the Gen7 1.4 board by the way!! gEDA has changed quite a bit since these instructions were written. I've just updated the wiki in the hope this answers your questions. Feel free to enhance the wiki further or to post here again, if things are still unclear. Maintaining several versions of the same thing is always error-prone and so far nobody wrote a script to create this GND-plane version automatically. I was wondering if someone thought about using a Allegro 3992 for generation 7 ? It exists in dip package , so maybe a simple card could still made with steper controler inside ? I didn't study it really, but before i do i prefer ask here ? Instead of using STEP and DIR, you change a stepper motor's status by sending 56 bits of data for each status. Each step requires a new status. Looking at the serial line timing diagram at the bottom of page 9, minimum clock time is 40 ns + 40 ns = 80 ns, or 12.5 MHz. For 56 bits, a write cycle would be about 5 microseconds, resulting in a maximum step rate of 200 kHz. Surprisingly fast. Always assuming I understood this diagram correctly. The challenge would likely be to make the ATmega calculate and send out this data at a rate of at least 20kHz, simultanously for at least 3 steppers. That is very interesting ( I admitt i didn't enter in details like you just did ). I just noticed there was an experimental card using it . I love the spirit of gen7, because it's the real reprap style ( do it simply , cheap and with home tools ), I try in spare time to look for nice upgrades . Love it! Have fun. I think I'm going to have to get me a few of those to play with soon. Generation 7 Electronics v1.4.1 is released. This release should put an end to all the MOSFET discussions. There was noteworthy research (for RepRap measures) to find the facts: [reprap.org] . Also result of this research is, heated beds should be run at low PWM frequencies, like 50 or 80 Hz. Teacup supports this, it's even the default. To what I've heard, other firmwares don't even support PWM for the heated bed, so they're safe. Happy Birthday, Generation 7 Electronics! October 10th, 2010 was the day when the Gen7 wiki page was created. A PCB with a few bags. One of the bags has the smallest available through-hole AVR CPU inside. Looks like this isn't about unpackaging something, it's about assembling. USB - SPI? or VUSbtiny? I hope I can get serial commnications established over SPI somehow. As you probably know, the ATtiny has no hardware RS232 protocol built in and doing this in software is pretty slow (tha japanese page talks about 4800 baud maximum). One question to be solved: who is the SPI master? Is it the ATtiny, the ATmega can't talk to other SPI devices (e.g. SD card), right? Is it the ATmega, it has to poll the ATtiny all the time. That would ne interesting, as SPI would enable sending data a lot faster than ANY serial. Though, if you want to, use a tiny2313 with AVR-CDC - can do 38400 - been using it for a while on my Gen 7. Don't know if you saw the other post, but got LCD working over i2c too. It's nice you have your ATtiny working, Peter. So far I can't find any setup instructions. Did I miss something? Edited 1 time(s). Last edit at 10/13/2012 07:52AM by peter6960. I resoldered pin 1 to the reset pin, still no change. Obviously I'm missing something. Edited 1 time(s). Last edit at 10/13/2012 01:04PM by Traumflug. Is that with arduino as ISP? Edited 1 time(s). Last edit at 10/13/2012 01:42PM by peter6960.